The lead researcher in the study, Tim Coulson from Imperial College London, said the island provided an ideal opportunity to tease apart the factors driving the sheep's physical change. 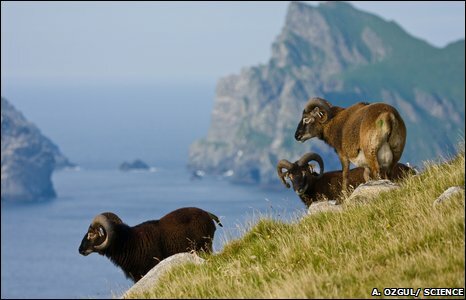 "The island is almost like a natural laboratory - there are only the sheep and the vegetation there," he said. He and his team had access to detailed information about the sheep that had been collected over more than two decades. "We have so much great data," said Professor Coulson, "that we were able to write a ledger of how much of an effect each of the different factors had on the sheep." They used a formula called the "Price equation", which was designed by evolutionary theorist George Price to predict how a physical trait, such as body size, will change from one generation to the next. With all of this data, the team was able to "rearrange the equation" and use it to work out how much of a contribution each driver made to the sheep's body size. They found that the local environment had a stronger effect on the animals than the evolutionary pressure to grow larger. "In the past, only the big, healthy sheep and large lambs that had piled on weight in their first summer could survive the harsh winters on Hirta," said Professor Coulson. Because of climate change, he explained, grass for food is now available for more months of the year on the island. "Survival conditions are not so challenging - even the slower growing sheep have a chance of making it, and this means smaller individuals are becoming increasingly prevalent in the population," he said. 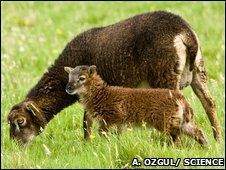 The team also found that younger sheep tended to give birth to smaller lambs - a phenomenon they termed "the young mum effect". This effect, said Professor Coulson, combined with environmental changes had "overriden what we would expect through natural selection". As for the future of the sheep, the team believes that they are still shrinking. "The next step is to extend our description of past change into a predictive model," said Professor Coulson. "But it's too early to say if, in 100 years, we will have chihuahuas herding pocket-sized sheep."